Dolvin's Technology Consulting and Finance Software Blog: How Much Do Cyber-criminals Make with Your Personal Data? 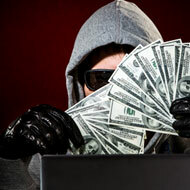 How Much Do Cyber-criminals Make with Your Personal Data? According to a study from the Kapersky Lab, a global cybersecurity company, criminals can sell an individual’s complete digital life for less than $50. The market for a single breached account is even lower. You’ll be surprised to learn the various ways criminals are stealing and selling a person’s complete digital life on the dark web.